The problem with gardens nowadays is they’re just too tidy! Most creepy crawlies prefer messy environments with plenty of nooks and crannies to hide away in. These little critters form an essential part of our ecosystem so it’s important that we help them out. So, why not make them a purpose built home? Open your own bug hotel or create a massive insect tower and your garden will be buzzing with all sorts of weird and wonderful invertebrates in no time. The hungry birds and mammals which feed on these juicy morsels will thank you too. Above all, your garden will be a great place to see wildlife of all kinds! Where should I put my hotel? Different species have different preferences so your hotel will need to cover a couple of areas. Many species like cool, damp and shady environments so near a tree or bush would be ideal. Your hotel needs to be easy to find so placing it near ponds, shrubs or other insect hangouts will make it much more user friendly. And make sure that your hotel has a sunny side for those sun loving visitors. The great thing about bug hotels is that there are no rules! Be creative and use any old materials that you find lying around your garden, house or shed. Old bits of wood, bricks, dry leaf litter, straw and roof tiles are all great places to start, but try to keep it as natural as possible. If you’ve not made one before, it’s best to start small. Make one or two small bug hotels and see what you can attract. Once you get a bit more confident, try combining a few different environments to make a grand insect tower! Once you have your materials together, you can create your micro environment. A leaf pile is a great place to start. To do this, create a cylinder out of chicken wire or similar mesh, push some stick or twigs through the bottom holes and fill it with leaves. Put a piece of wood over the top to stop rain water from getting in. Your leaf pile will shrink as leaves dry out so top it up so your visitors have plenty of leaves to scurry underneath! 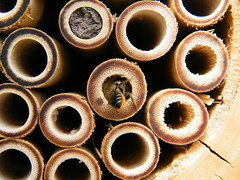 Bamboo canes provide a great place for weary solitary bees to rest or make a nest. If you can’t find any of these, get an adult to help you drill some holes into a block of wood for the perfect bee hang out. Different sized holes will cater for all species and your hotel will be buzzing in no time! The great thing about this one is that loads of creepy crawlies like these kinds of holes and you may see ladybirds or even dragonflies flitting in and out. 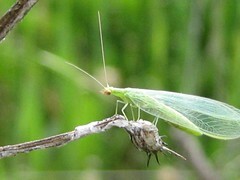 Another good starting point is a simple home for Lacewings. Roll up a piece of corrugated cardboard and tie it together or cut the top of an old plastic bottle and slot it in. These fragile little insects are great to have around as they gobble up garden pests such as aphids. Beetles love dark and damp holes to slink away into so collect together stones, rubble, leaves and sticks and they’ll move in in no time. Rotting logs are also great for these shiny predators so keep any old wood for them too. It’s not just insects that will use this kind of hotel. Amphibians like newts love to squeeze into cool, shady gaps in rocks or rubble so look out for these as well. Make it as messy as you like to create different sizes and shapes of nooks and crannies in all sorts of different materials, some damp and some nice and dry. Use your imagination and all sorts of garden critters will drop by! 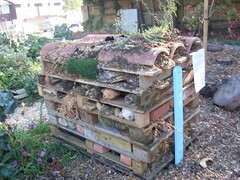 Go to www.buglife.org.uk for more information and great ideas for bug hotels! Don’t worry if your hotel doesn’t attract any creepy crawlies straight away. It may take a while for them to find it so be patient and you’ll be rewarded for your hard work with a thriving, insect filled garden. We have a diverse bunch of friendly people working behind the scenes on our videos and website. We all work for free, fuelled only by our shared love of wildlife. If you’d like to become part of the team, get in touch!